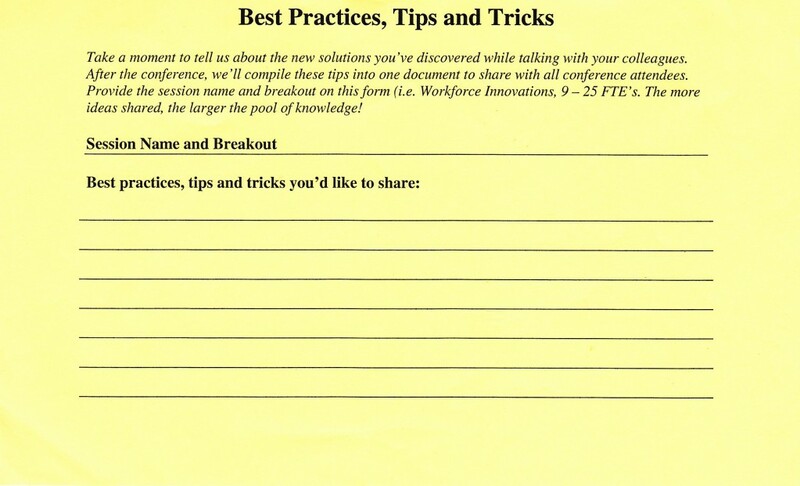 Here’s a simple way to turn insights from individual conference attendees into a shared resource that can be used by everyone. Create a form like the one illustrated above, and make multiple copies easily available at all sessions (place them on tables, have a stack by the room entrances etc.) At the start of the event, encourage attendees to use the forms to write down best practices, tips, and ideas sparked during sessions, explaining that all contributions will be compiled and shared with everyone after the conference. Provide boxes for attendees to post completed forms. Once the conference is over, promptly summarize the ideas shared and post the resulting document on the conference website or other conference community. Thanks to the organizers of the MGMA PEER conference, where I first saw this idea in action. This entry was posted on Sunday, April 24th, 2011 at 9:47 am	and is filed under Event design, Learning. You can follow any responses to this entry through the RSS 2.0 feed.You can leave a response, or trackback from your own site.